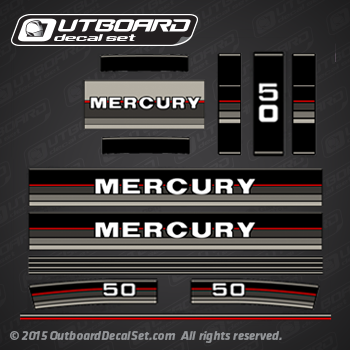 Mercury 50 hp decal set replica for 1986, 1987 and 1988 Mercury Outboard motors. 1986 1988 MERCURY 50 hp EO: 1050706 EO, 1050707 EO, 1050706 EO, 1050707 EO. 1986 1988 MERCURY 50 hp ELO: 1050716 ELO, 1050717 ELO, 7050716 ELO, 1050716 ELO, 1050717 ELO. 1986 1988 MERCURY 50 hp ELPTO: 1050726 ELPTO, 1050727 ELPTO, 7050726 ELPTO, 1050726 ELPTO, 1050727 ELPTO. 1986 1988 MERCURY 50 hp M: 1050200 M, 1050202 M, 1050203 M, 1050204 M, 1050205 M.
1986 1988 MERCURY 50 hp ML: 7050220 ML, 7050225 ML, 1050220 ML, 1050222 ML, 1050223 ML, 1050224 ML, 1050225 ML. 1986 1988 MERCURY 50 hp MXLH: 1050243 MXLH. 1986 1988 MERCURY 50 hp E: 1050500 E, 1050502 E, 1050503 E, 1050504 E,7050500 E, 7050503 E.